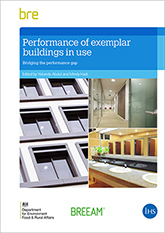 This report reviews the operational performance of three public-sector office buildings designed to achieve energy and water efficiency over the longer term, based on a study carried out in 2010–2012. The study, funded by BRE Trust, the Cabinet Office and the Department for Environment, Food and Rural Affairs (Defra), highlights the benefits and challenges of environmental design in relation to the building handover process and the management of facilities. It reviews the issues faced by designers, clients and building managers in bridging the gap between designed performance and actual operational performance over a building’s lifetime. While the buildings evaluated are all public sector, many of the lessons learned from this study are equally applicable to the private sector.